Being just a few years into playing the guitar myself, I still remember the hurdle of just being able to play something all the way through without stopping or screwing up too much. I remember the additional hurdle of just getting my brain to allow me to sing one thing while playing another. 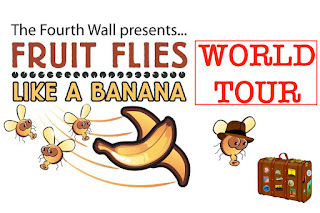 So the things that the trio of musician/singer/physical theater performers who make up The Fourth Wall and tour with their show Fruit Flies Like A Banana do never ceases to astonish me. And I suppose most audience members. It’s why we delight in these three different permutations of the same concept - a couple dozen short music pieces performed at random, order determined by audience participation, and the music never stands still. There’s a whimsy running through the whole thing, an enjoyment of a music and a desire to share it in as many varied ways as possible. 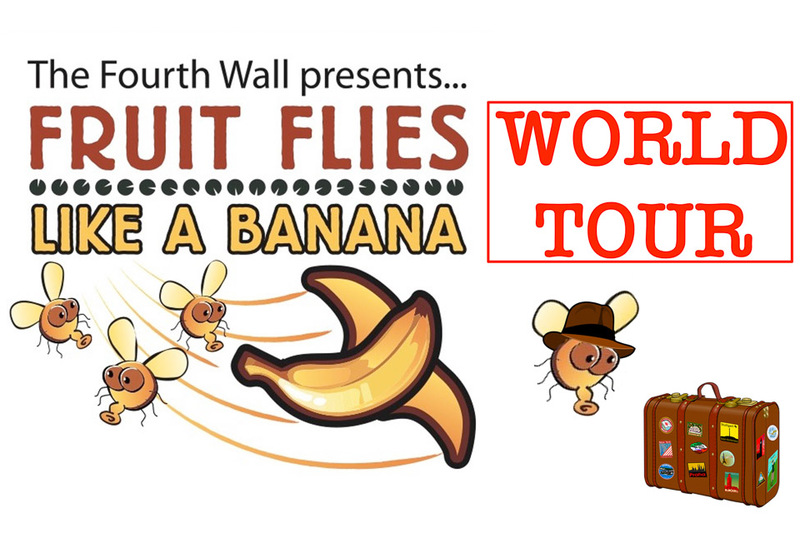 The World Tour aspect of Fruit Flies Like A Banana this time had the audience choosing from starred locations on a large inflatable globe tossed into the house at the end of each piece of music. In total, we end up visiting Poland, Argentina, Japan, Antarctica, North Pole, Mexico, Congo, Ocean, Scotland, France, Australia, Canada, Tuva, and of course the USA, all in just an hour. As they introduce the location, composer and some brief history of the piece of music, Hilary Abigana, Greg Jukes, and C. Neil Parsons pull out whatever instrument is going to get spotlighted this time. There’s accordion, bass trombone, boomwackers, crotales, didgeridoo, flute, euphonium, piccolo, toy piano, vibraphone, whistle, wood block and yes, even a flower pot. There’s also their own human voices, and dancing, contorting bodies. And in their traditional segment spotlighting shows of other Fringe artists in the audience that’s always in the mix, there’s the added fun of our own local storyteller Allegra Lingo joining in for a musical bit. Fruit Flies is at Theater In The Round this time and they seemed to take a particular delight in addressing this added challenge: constantly turning and whipping around the space, creating a great stage picture no matter what corner of the 360 degree audience expanse you were situated in. Like the bar they set themselves isn’t already high enough and they just wanted that extra bit of difficulty to tackle and overcome - always with a smile on their faces and a twinkle in their eye. Fruit Flies Like A Banana seems to be a perfect distillation of the wonderful oddities that bloom in this festival once a year. Where else could something like this live and find a home? Just describing Fruit Flies to strangers, it seems a great way to define the Fringe to the uninitiated. “Fringe is the place where crazy, beautiful stuff like this happens.” I hope The Fourth Wall never gets tired of us and keeps coming back as often as the lottery gods and laws of chance will allow.